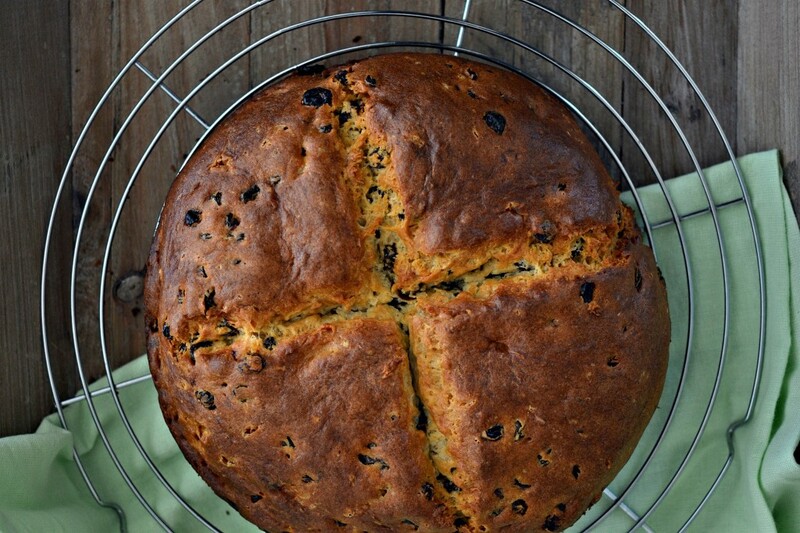 Irish Soda Bread for St. Patrick's Day | Great gluten free recipes for every occasion. I get so caught up in the business of life sometimes. I forget what’s right in front of me. Get the kids off to school with some breakfast in their bellies, lunches in their bags, courage screwed on tight to face a new day. Get a new blog post up & at ’em. Start working on the next one. And the one after that. Maybe throw a proper dinner into the mix. Cupcakes are not dinner. You get the idea. I know you do. You smartypants, you. 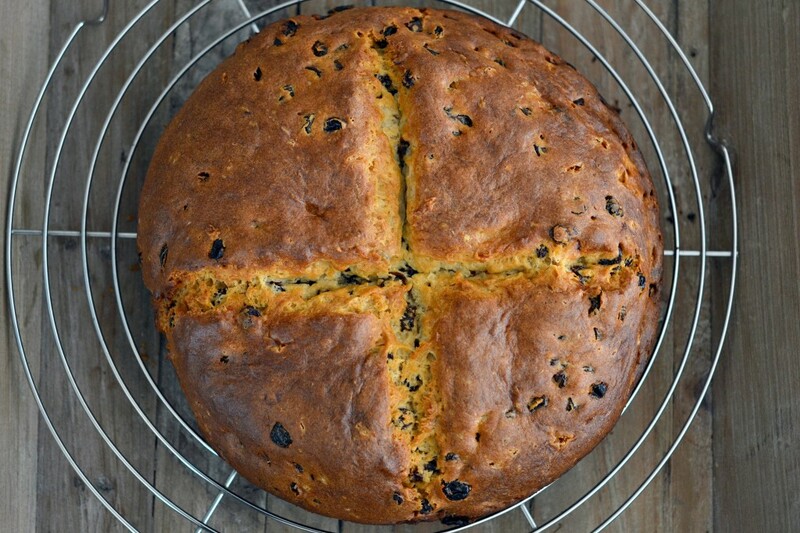 This time, what was right in front me … was this Irish Soda Bread. 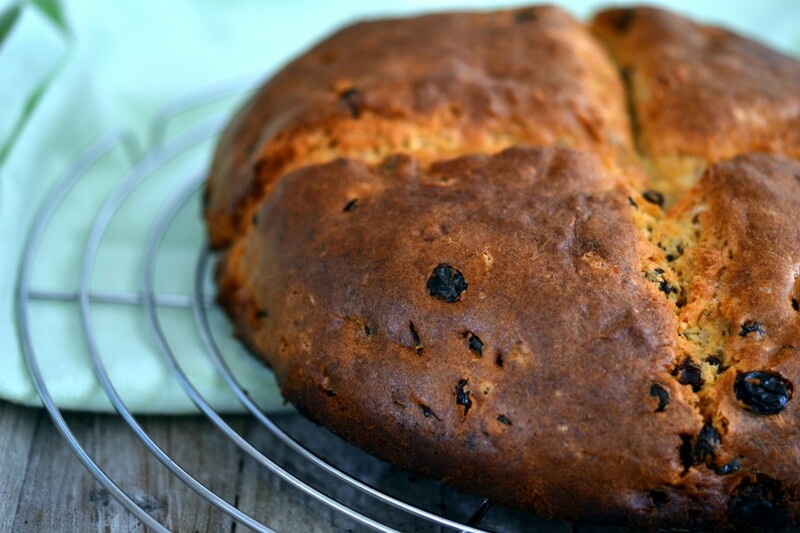 On page 110 of the Shoestring Cookbook, there’s a recipe for Gluten-free Irish Soda Bread. And it’s a good one. Since it wasn’t possible for the book to have a photo for every recipe, I thought you might like to see photos on here of some cookbook recipes. Think of it like the sneak peeks we did of recipes like Gluten-Free Saltines, Yeast-free English Muffins and Chocolate Doughnuts that will be in my next cookbook, Shoestring Quick & Easy, but better. 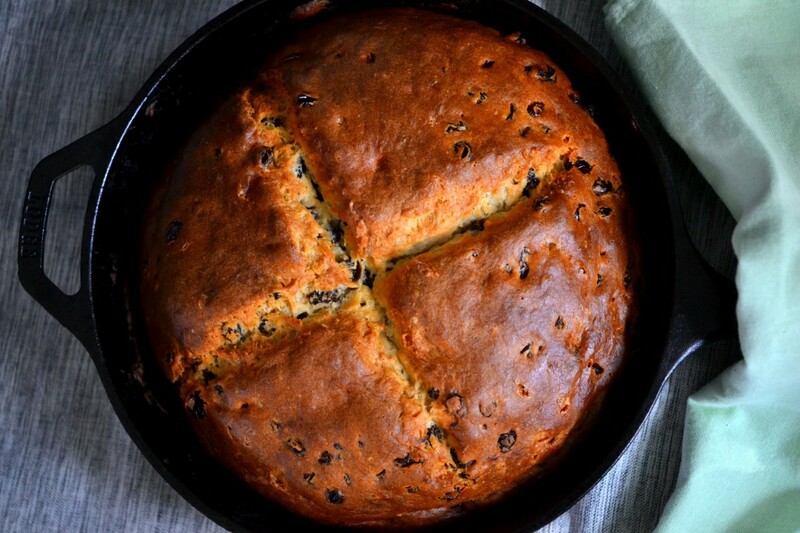 With book #1 in hand, you can make this recipe today, just in time for good ol’ St. Pat. Here’s something a little different I did this time around. 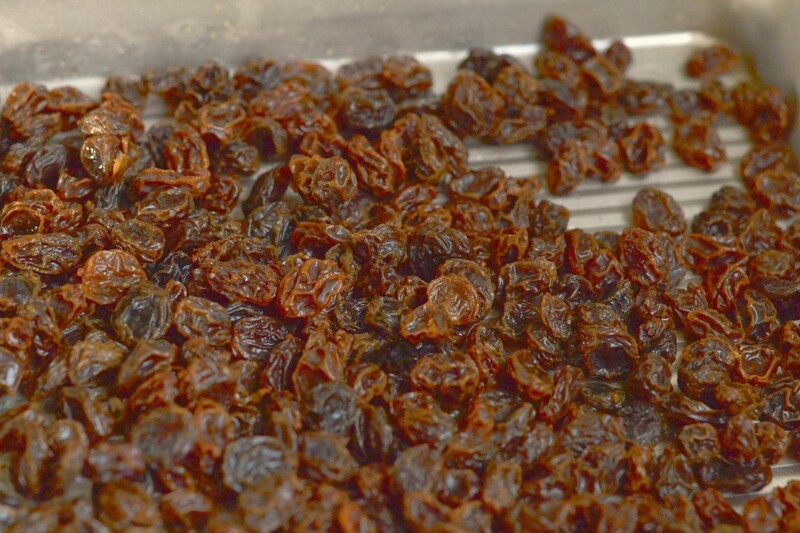 I soaked the raisins in warm water. But since I didn’t want warm raisins messing up my pastry, I rinsed them in cold water after they soaked and spread them out on a baking sheet. Then I popped them in the freezer until they were firm (about 10 minutes). They make the soda bread even flakier & fluffier. 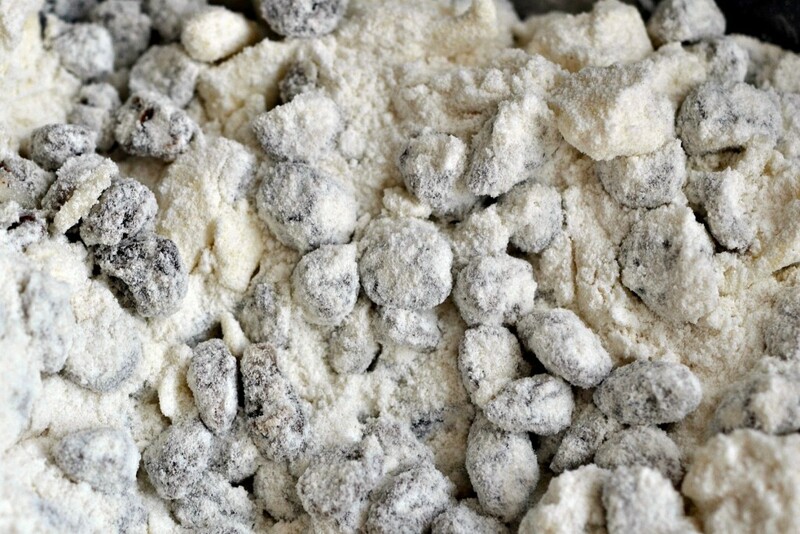 Then I tossed the raisins in the dry ingredients before adding the milk and forming the dough. 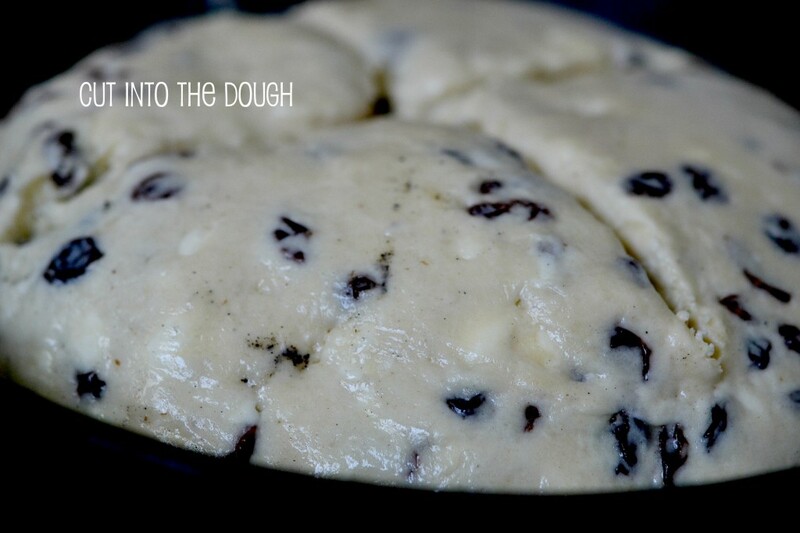 The dough is sticky, so I piled it into the pan (I used a seasoned cast iron skillet) and smoothed the top with cold, wet hands. And I cut slashes in the dough in an “X” with a sharp, wet knife. Here’s what it looks like when it comes out of the oven, still in the pan. It finishes cooling on a wire rack. Strike up the band, Danny Boy; the pipes, the pipes are calling. P.S. For the next book, Shoestring Quick & Easy (available for preorder now on Amazon! ), out this October, I’d like you to see more pictures than what’s in the book itself. Maybe a bunch of photos you can download from the blog when the book comes out? Like a mini-book, but just photos. And for free. Not sure the format, though. I’m open to any and all ideas! Nice idea, freezing the raisin tushes. I bet they cooperate more that way. That looks might tasty. Thanks, Lisa. :) Freezing tushes is just good policy generally, I always say. I was just contemplating how I’m going to make corned beef and cabbage for St. Pats, and then there was soda bread! Yay! I was going to ask though, as I am not a huge fan, do the raisins have to be in there? or can I leave them out and just invite them to my next granola party instead? The raisins don’t have to be in there, but you should replace them with something. Chopped nuts, maybe? Can I sub organic apple cider vinegar for the white wine vinegar? Is there a substitute for the creme of tartar? I have everything on hand except that & wanted to whip it up quick without having to run to the store, lol. Book is great! I’m with Ashley on her pdf idea. You must have been reading my mind. Last night I made your gee eff hamburger buns, and plan to make Irish Soda Bread today. I loved the cupcake-palooza you were having these last few days. Lisa at GF Canteen made cupcakes too. Cupcakes = portion control. I have to buy a new pan though because mine rusted, (yuck), in the dishwasher over the weekend. Never had that happen before. Love the feedback! That is so useful. Thank you! We’re so connected, you and me. I did read your mind. It has been a cupcake-palooza, hasn’t it? Good point about portion control. I tend to like cupcakes because no one can claim that they own part of what is rightfully my piece of cake. So I was thinking more portion protection. ;) Buy a USA Pans muffin tin! But don’t put it in the dishwasher. You won’t have to, anyway. I can usually just wipe mine clean with a swipe. I think adding the photos would be a great idea! I love seeing what it’s supposed to look like! And I would like it in a pdf so then I can add it to my kindle and don’t have to haul my computer over to the kitchen (or have to run back and forth, that’s just too much work)! That’s a great point, Ashley. Thank you for mentioning that!